It's officially spring and so it would also appear, ground breaking season. 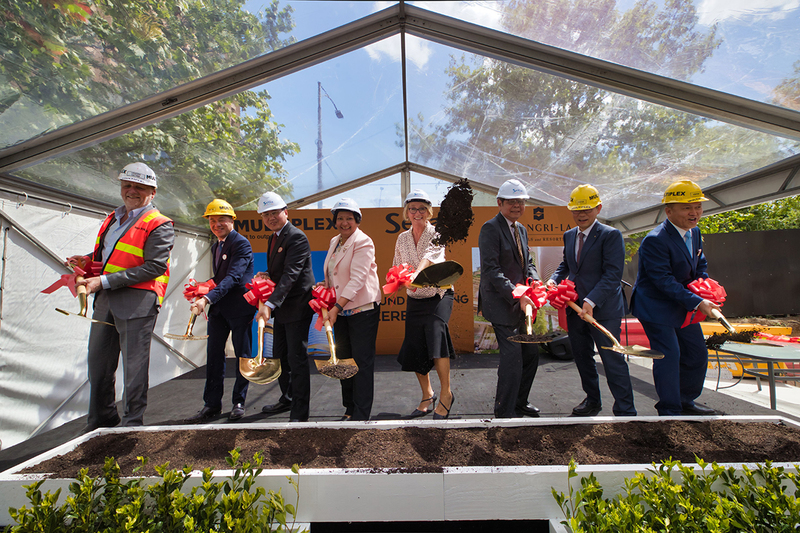 Urban.com.au was onsite along with Lord Mayor Sally Capp and representatives from S P Setia, Multiplex, Fender Katsalidis, Cox Architecture and Shangri-La to celebrate the ground breaking of Sapphire By The Gardens and the official appointment of Multiplex as head contractor. S P Setia’s 62-storey, $565 million development mixed-use development will feature Melbourne’s first 5-star Shangri-La hotel of 500 suites, in addition to 300 apartments with 95% sales achieved at time of writing. With Multiplex on board as the builder, a 3 year construction programme is expected with Shangri-La Melbourne due to open in 2022. Located at 308 Exhibition Street opposite the UNESCO World Heritage-listed Carlton Gardens, the design of Sapphire By The Gardens draws on and celebrates its garden location with a podium and urban realm characterised by lush greenery. The dual tower development's signature feature however, is its two-storey sky bridge linking the towers 50-storeys up in the air, and providing unique panoramic views across Melbourne to Carlton Gardens and beyond. Speaking at the event to mark the occasion, Architect and Founding Director of Fender Katsalidis (FK), Karl Fender joked that if not for FK and Cox competing against each other, either firm would have won the competition outright. Instead because S P Setia couldn't split them they formed a partnership combining ideas from their respective concepts to produce Sapphire By The Gardens - "two architects for the price of one" said Fender with a wry smile. Today's ground breaking ceremony marks an extremely significant milestone not just for Setia, but for Melbourne and so we are deeply honoured to have the Lord Mayor present to celebrate this auspicious occasion. We are here of course to mark the commencement of the construction works of this visionary twin tower project comprising Victoria's first Shangri-La hotel and Sapphire By The Gardens residences. S P Setia with our A-team consultants and our giant builder Multiplex, has been working tirelessly to bring this project to reality. And now here we stand, proud that this has been achieved, and accordingly we would like to thank the City of Melbourne, in particular for the support it provided during the formative stages of the project. Effort in each of our projects, both large and small to sensitively contribute to their context but perhaps none moreso than Sapphire By The Gardens. 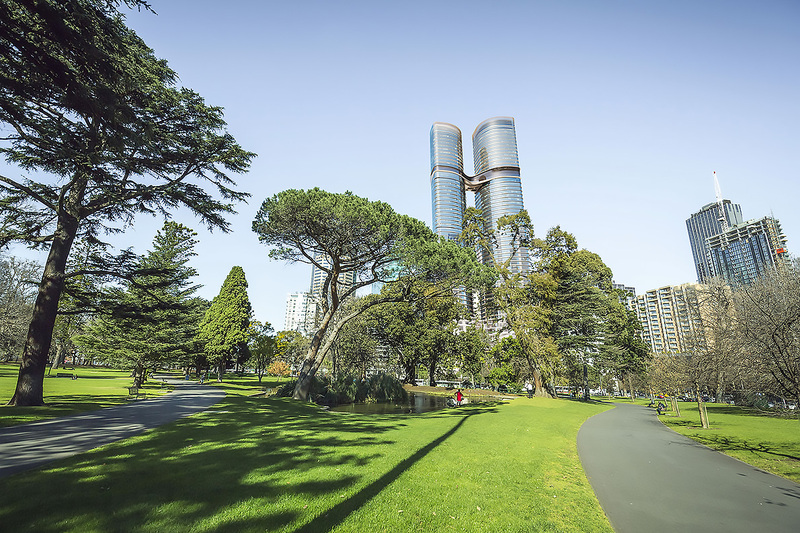 With its Shangri-La hotel, these striking twin towers mark the north-eastern gateway into the city through the stunning World Heritage Carlton Gardens and this has inspired a richly landscaped podium and forecourt presence to the public realm. On the other hand floating high above, the Skybridge - also open of course to the public and a first in Australia - will provide never-before-seen views of Melbourne and the Gardens. The Shangri-La is one of the finest hotels in the world, it is fitting that it enjoys the primacy of this location which is one of the finest in Melbourne. We are extremely proud to deliver this project to Melbourne and extremely privileged to share this moment with our Mayor, Sally Capp. On this very spot a significant architectural project is soon to rise above the streets of Melbourne. We will have our oldest iconic building, the Royal Exhibition Building looking on as our newest iconic building with its Skybridge is built right here. Congratulations to everyone involved. I want to acknowledge that ambition is indeed at home right here in Melbourne. Melbourne's booming economic performance shows no sign of slowing down and projects such as this with its enormous scale is all important in terms of the investments and development happening right here in our city. We expect our residential population to rise by over 50% over the next decade and so the investment in the much needed housing and accommodation that will happen through Sapphire By The Gardens is very welcome. I also note the thoughtfulness of what will happen at a street level as part of this project and the fact that this environment will add to Melbourne's reputation for engaging in distinctive experiences, you are also delivering that. Today is made very auspicious by this ground breaking ceremony, yet to come. It's ground breaking on a very, very special site in Melbourne, possibly, I would argue, the best site in Melbourne. It's on the gateway into Melbourne from the east, through the stunning World heritage gardens of the Carlton Gardens so it's appropriate that this gateway, this entry into Melbourne, is celebrated in the right way and makes all the right announcements. Announcements such as 'great design comes first'. Our city is based on great design, past and present and going forward. On that note I really would like to make a special mention to Phillip Rowe and his team at Cox, who are our co-architects, co-designers on this project. It will also sign Melbourne, the garden city, with this incredible garden entry way, in the design process we thought about bringing the Carlton Gardens across LaTrobe Street and into the building, through a beautiful plaza meant for the public, and also up the face of the building, particularly the podium. The futuristic Skybridge - another first for Melbourne - will be fantastic, it will provide new views over Melbourne for everybody whilst you sip your gin martini.